Just when nuclear energy had come to be seen as part of the solution to energy and global-warming challenges, the serial reactor incidents in Fukushima have dealt a severe blow to the world nuclear-power industry, a powerful cartel of less than a dozen major state-owned or state-guided firms. Even before the Fukushima No. 1 plant become the site of the world’s worst accident since Chernobyl, the share of nuclear power in worldwide electricity production had been stagnant for a quarter-century. In fact, after being constant at 16 to 17 percent from 1986 to 2005, the contribution of nuclear power in global electricity actually has dropped to 14 percent since then. International studies have shown that nuclear power, although a 50-year-old mature technology, has demonstrated the slowest “rate of learning” in comparison to other energy sources, including newer technologies such as wind power and combined-cycle gas turbines. Nuclear power remains highly capital-intensive. It has high up-front capital costs, long lead times for construction and commissioning, and drawn-out amortization periods that put off private investors. The industry’s trumpeting of a global nuclear renaissance thus has been premature. 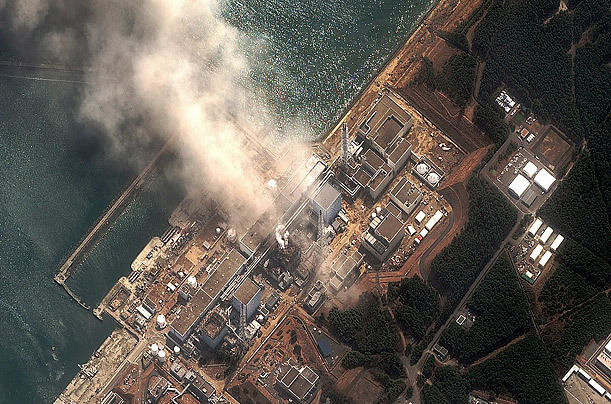 But after Fukushima, the attraction of nuclear power is likely to dim worldwide. Inherently risky, water-intensive and vulnerable to natural disasters, nuclear-power plants will now face greater public scrutiny. Many nuclear-power reactors are located along coastlines because they are highly water-intensive. Yet natural disasters like storms, hurricanes, and tsunami are becoming more common, owing to climate change, which will also cause a rise in ocean levels, making seaside reactors even more vulnerable. For example, many nuclear-power plants located along the British coast are just a few meters above sea level. In 1992, Hurricane Andrew caused significant damage at the Turkey Point nuclear-power plant on Biscayne Bay, Florida, but, fortunately, not to any critical system. All energy generators, including coal- and gas-fired plants, make major demands on water resources. But nuclear power requires even more. Light-water reactors (LWRs) like those in Japan and the United States, which use water as their main coolant, produce most of the world’s nuclear power. The huge quantities of local water that LWRs use for their operations become hot-water outflows, which are pumped back into rivers, lakes and oceans. Because reactors located inland put serious strain on local freshwater resources — including greater damage to plant life and fish — water-stressed countries that are not landlocked try to find suitable seashore sites. But whether located inland or on a coast, nuclear power is vulnerable to the likely effects of climate change. As global warming brings about a rise in temperatures and ocean levels, inland reactors will increasingly contribute to, and be affected by, water shortages. During the 2003 heat wave in France, operations at 17 nuclear reactors had to be scaled back or stopped because of rapidly rising temperatures in rivers and lake. Paradoxically, the very conditions that made it impossible for the nuclear industry to deliver full power in Europe in 2003 and 2006 created peak demand for electricity, owing to the increased use of air conditioning. Indeed, during the 2003 heat wave, Electricite de France, which operates 58 reactors — the majority on ecologically sensitive rivers like the Loire — was compelled to buy power on the European spot market. The state-owned EDF, which normally exports power, ended up paying 10 times the price of domestic power, incurring a financial cost of 300 million euro. Similarly, water and heat problems caused by a heat wave in 2006 forced Germany, Spain, and France to take some nuclear power plants offline and reduce operations at others. Highlighting the vulnerability of nuclear power to environmental change or extreme-weather patterns, in 2006 plant operators in Western Europe also secured exemptions from environmental regulations so that they could discharge overheated water into natural ecosystems — an action that affected fisheries. France likes to showcase its nuclear power industry, which supplies 78 percent of the country’s electricity. But such is the nuclear industry’s water intensity that EDF withdraws up to 19 billion cubic meters of water per year from rivers and lakes, or roughly half of France’s total freshwater consumption. Freshwater scarcity is a growing international challenge, and the vast majority of countries are in no position to approve of such highly water-intensive inland-based energy systems. Seaside nuclear plants do not face similar problems in hot conditions because ocean waters do not heat up anywhere near as rapidly as rivers or lakes. And because they rely on seawater, they cause no freshwater scarcity. But as the Fukushima reactors have shown, coastal nuclear-power plants confront more serious dangers. When the 2004 Indian Ocean tsunami struck, it flooded India’s Madras Atomic Power Station. But the reactor core could be kept in a safe shutdown mode because the electrical systems had been installed on higher ground than the plant itself. But unlike Fukushima, the Indian plant did not bear the direct tsunami impact. The central dilemma of nuclear power in an increasingly water-stressed world is that it is a water guzzler, yet vulnerable to water. And decades after Lewis L. Strauss, the chairman of the United States Atomic Energy Agency, claimed that nuclear power would become “too cheap to meter,” the nuclear industry still subsists on munificent government subsidies. While the appeal of nuclear power has declined considerably in the West, it has grown among the so-called nuclear newcomers, which brings with it new proliferation and safety challenges. Moreover, with nearly two-fifths of the world’s population living within 100 km of a coastline, finding suitable seaside sites for initiation or expansion of a nuclear-power program is no longer easy. Without a breakthrough in fusion energy or greater commercial advances in breeder (and thorium) reactors, nuclear power is in no position to lead the world out of the fossil-fuel age. In fact, Fukushima is likely to stunt the appeal of nuclear power in a way similar to the 1979 Three Mile Island accident and the 1986 Chernobyl meltdown. Brahma Chellaney is the author of “Nuclear Proliferation” (Longman, 1993) and “Water: Asia’s New Battlefield” (Georgetown University Press, forthcoming).